When a class extends a class, which extends anther class then this is called multilevel inheritance. 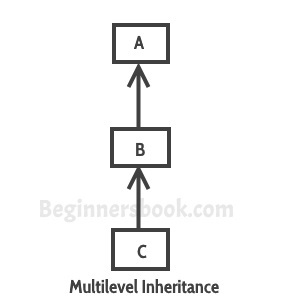 For example class C extends class B and class B extends class A then this type of inheritance is known as multilevel inheritance. It’s pretty clear with the diagram that in Multilevel inheritance there is a concept of grand parent class. If we take the example of this diagram, then class C inherits class B and class B inherits class A which means B is a parent class of C and A is a parent class of B. So in this case class C is implicitly inheriting the properties and methods of class A along with class B that’s what is called multilevel inheritance. In this example we have three classes – Car, Maruti and Maruti800. We have done a setup – class Maruti extends Car and class Maruti800 extends Maruti. With the help of this Multilevel hierarchy setup our Maruti800 class is able to use the methods of both the classes (Car and Maruti). i want details of an employee working in company like his name ,age ,designation by typing his name i want to get all details of him by using multiple inheritance in java? please provide this answer?